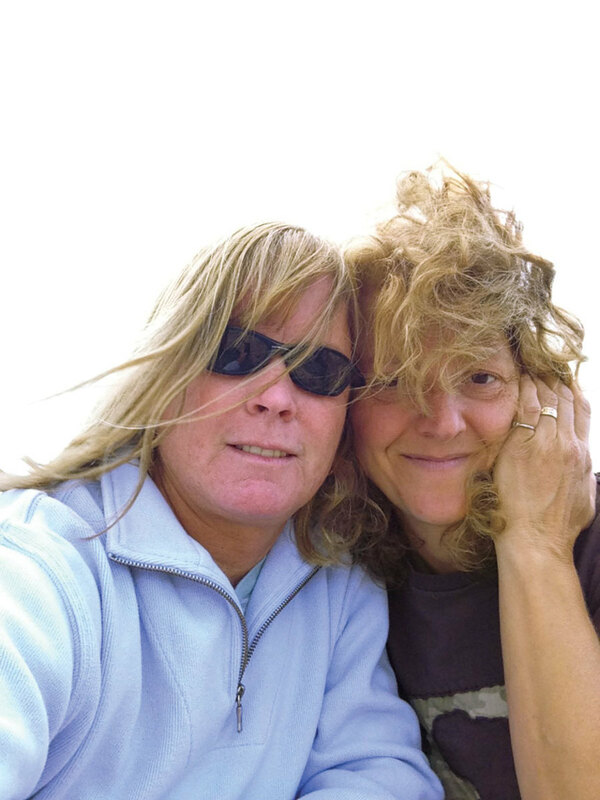 Vickie (left) and Laurie Silvia. and across the sound to Long Island. “We really like Shelter Island and Three Mile Harbor,” Silvia says. Sparrow is powered by a single 280-hp Volvo Penta diesel and cruises at 8 to 9 knots. Top speed is around 15 knots. Fuel consumption is around 1½ to 2 gallons an hour, Silvia estimates. Electronics include a Raymarine chart plotter, depth sounder and, added last season, a Raymarine autopilot. The Nordic Tug has required minimal work and just a few upgrades. 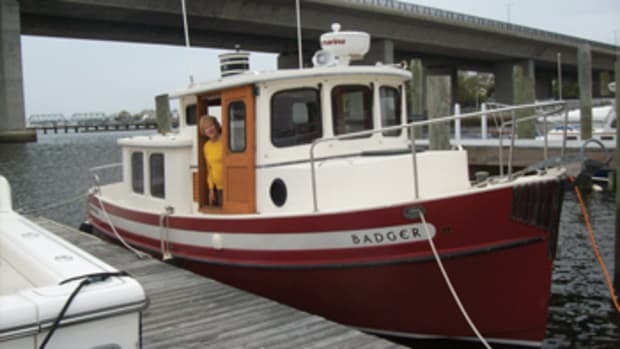 The upper and lower boot stripes were redone in patriot blue, and the handrails were removed and rebedded. A custom stainless Bimini top was fabricated, and Sunbrella privacy screens were fitted for the windows. 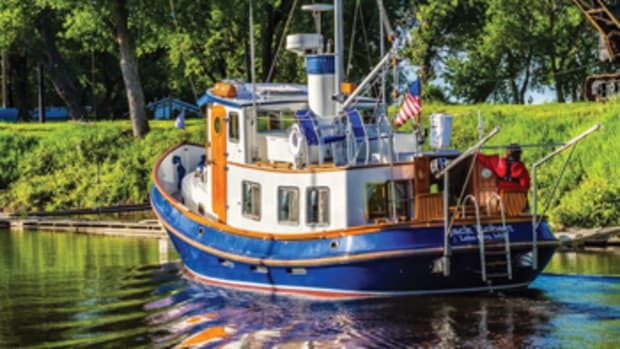 The Nordic Tug 32 is one of the Washington builder’s most popular models, with more than 300 sold. While it’s kept the salty look, with its plumb bow, tugboat stern and false smokestack, the design has undergone a number of modifications. Originally, the builder offered two interiors: one with an angled berth in the forward stateroom and the galley forward in the saloon, the other with a V-berth forward and the galley farther aft. In 2002, a new model, the 32+, was introduced. 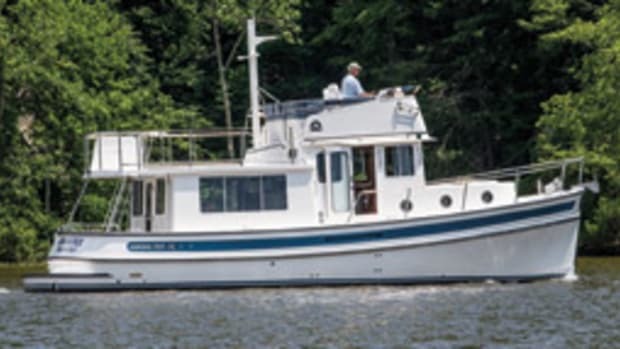 It had an interior with an island berth forward, a convertible settee in the saloon and a contemporary galley with an under-counter refrigerator. An integral swim platform was also added. 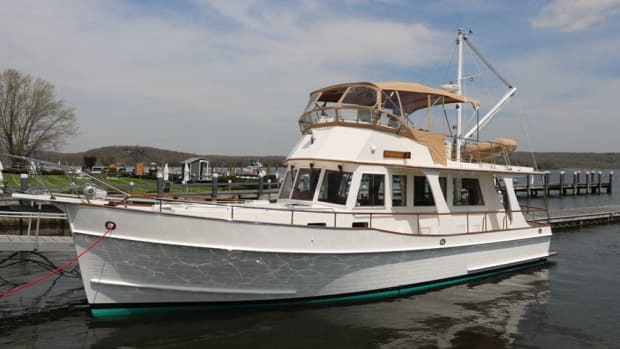 The finish aboard all the NT32 models is high quality, with a teak-and-holly cabin sole and teak paneling. Side windows provide light and ventilation for the saloon. 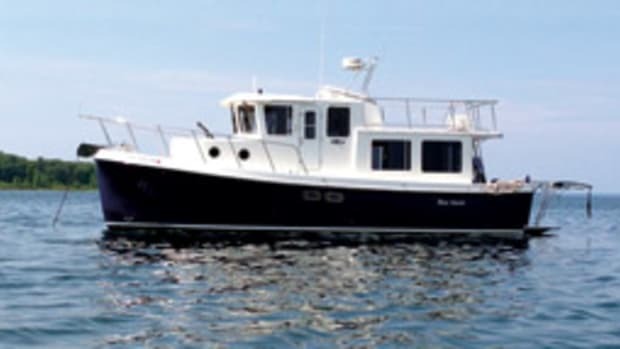 The pilothouse has the helm to starboard, and a sliding door accesses the deck. 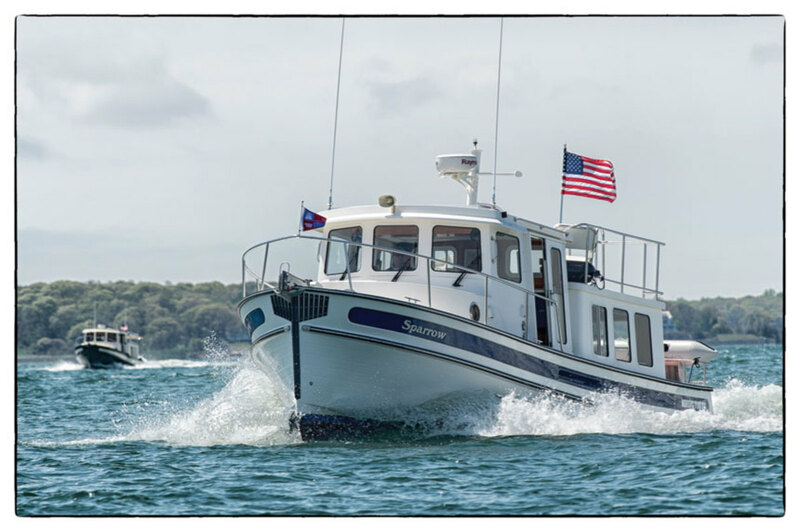 Standard power came from a 220-hp diesel, which gave the NT32 a cruising speed up to 12 knots; top speed was 15 to 16 knots, the builder says. 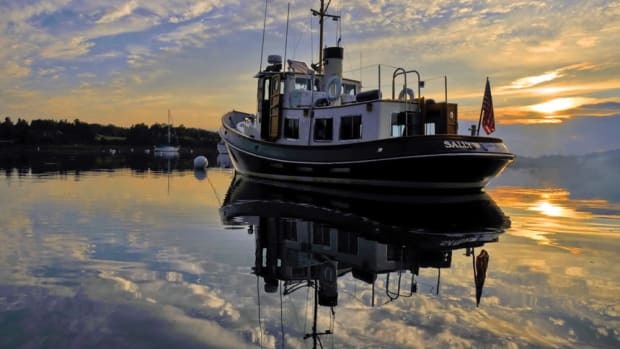 The boat was renamed the Nordic Tug 34 in 2013. 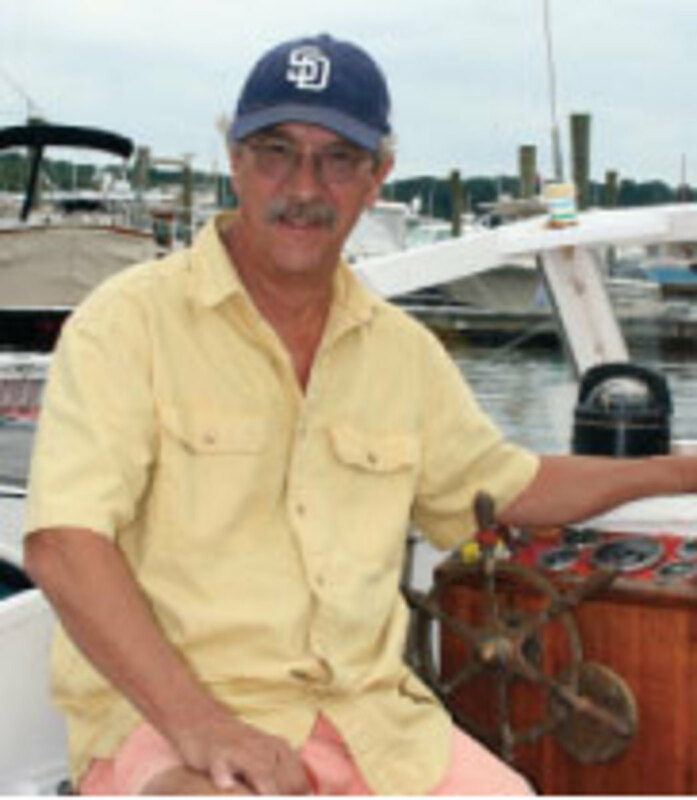 Jerry Husted and naval architect Lynn Senour founded Nordic Tugs in 1979 with the idea of building salty, fuel-efficient cruising powerboats. 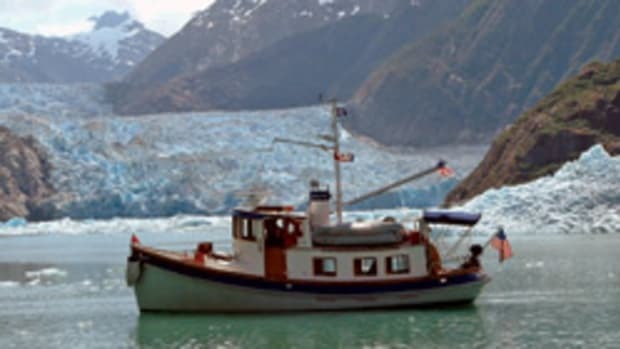 The first boat, a 26, debuted at a 1980 boat show in Seattle and caused a sensation: 54 were sold before the show ended. 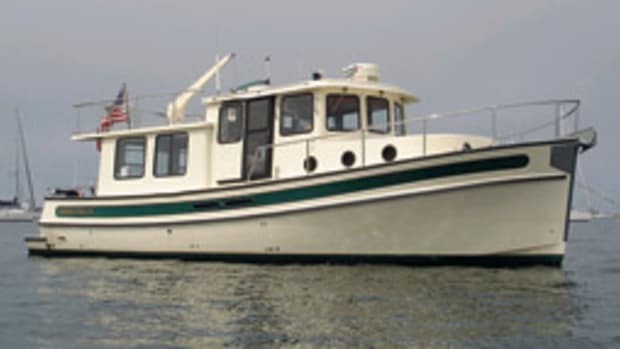 The Nordic Tug 32 came out in 1986, helping to further establish the builder’s position in the recreational tug/trawler market. The fleet today comprises six models from 26 to 54 feet.